"See GDI and User Object usage of all of your processes with Bear." Gather the information you want with another SZ Development application. Bear is a GDI and User Object usage application for giving you this information for all processes that are running on your computer. For more advanced users, this can be useful for gathering more information about your processes and tasks that are running on your computer to track down any potential problems. 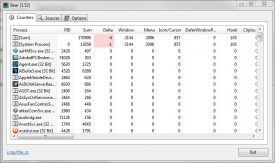 Using this application, you have the ability to track down GDI and user handle leaks by reviewing the information displayed by the software. You are able to identify where these leaks are coming from using Bear. The application gives you more detailed information by going to the details view so you can see all of the properties of the handles. You can also save bitmaps, icon, and cursors that are used on your computer with Bear. Bear is compatible with 32 and 64 bit versions of Windows 8.1, Windows 8, Windows 7, Windows Vista, Windows Server 2012, Windows Server 2008, Windows Server 2003, Windows XP, Windows 2000, NT4, Windows 98, and Windows 95. The application displays a lot of detailed information about the processes by displaying handle details and logs valuable information by saving the information to a CSV file to trace changes over time. 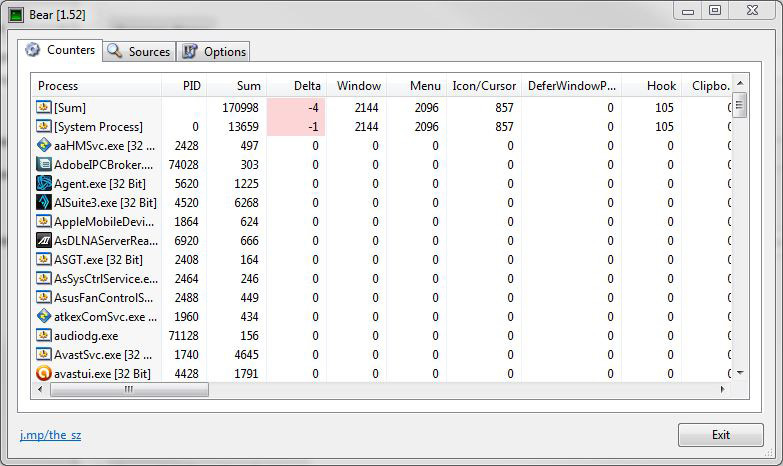 Bear is an application that is more suited for veteran users of Windows. If you are a beginner, it is likely that the information displayed by this application will not be very useful to you and proper knowledge on the information may be required to properly understand how valuable the application can be.